Over time skin elasticity decreases, collagen fibers are deformed and become much thinner – visually this is presented with formation of fine and deep wrinkles, sagging and folds. Radiofrequency pulses activate the natural processes of their renewal, while the speed of reproduction increases to the level that it was at a younger age. In other words, such lifting literally restarts the biological age if the skin cells, eliminating the main cause of various age-related changes – slow processes of collagen renewal. The FRACTORA treatment allows you to achieve natural skin rejuvenation, being a real replacement for plastic surgery. The efficiency of skin lifting and rejuvenation procedure with a FRACTORA hand-piece comes from the unique effect of RF pulses targeted to collagen fibers located in deep layers of the skin and acting like a kind of skeleton. The pulse is delivered through the needles on the surface of the FRACTORA hand-piece where each micro-needle is an electrode. Breaking in the skin these needle electrodes generate radio frequency pulses of the required power that compress the collagen fibers into microscopic spirals and tighten them. Clear lifting effect is visible even after the first procedure, simultaneously micro-scars and other defects are corrected. Fractional Lifting FRACTORA is so called “heavy artillery” in apparatus cosmetology and is an alternative to the surgical lifting. With non-surgical deep lifting, the skin is not only tightened like after surgery but also becomes firm and “keeps” the shape. This is a system of complete renewal of face, neck and decollete skin – a solution for such problems as deep mimic wrinkles, flabby skin, uneven skin texture and scars. The FRACTORA hand-piece delivers CR-energy through tiny electrodes producing localized fractional heat and ablation of the skin. Ablation is the safest and the most progressive way to “shake” the skin. Only stress can make the aging skin to “revive” and began to function actively. To do this, it must be traumatized. This sounds weird, but it is trauma exactly that makes the skin to reply and start active regeneration. Those cosmetic procedures that involve ablation are highly effective for the age-related skin changes treatment. After the procedure, there may be some swelling, slight tingling that vanish in 4-5 days. But the achieved result is significant and noticeable: the skin is tightened, its condition is radically improved in just one procedure! Pigment issues disappear completely. FRACTORA procedure can be combined with other treatments: mesotherapy, contour plastics etc. If you are young, but vexed with such imperfections as flabbiness, slight descent of turgor, grey complexion, small wrinkles, it is worth trying the FRACTORA FIRM treatment. This apparatus is designed precisely to solve such problems. Operating, it stimulates the production of collagen, which is responsible for the radiance and elasticity of our skin. FRACTORA FIRM – high safety and predictable efficiency: the technology eliminates the risk of skin damage and allows to carry out procedures all year round, even in summer, without any harm to the skin. FRACTORA FIRM hand-piece utilizes fractional radiofrequent energy simultaneously controlling skin heating temperature. Benefits of FRACTORA FIRM are in non-invasiveness (the integrity of the skin is not broken), in possibility to achieve immediate noticeable result and visible skin and volume tightening in the area of application after the treatment. The procedure is applicable to any type of skin, including dark and tanned, and it is recomended both for women and men. During the procedure, a slight accumulation of heat is experienced, in the case of discomfort or individual intolerance of the procedure the intensity of heating can be reduced, as well as threshold temperature can be lowered. The procedure takes up to twenty minutes. To achieve the maximum result, it is recommended to take a series of 4 to 5 treatments of FRACTORA FIRM with a 10-day interval. Long-lasting effect. 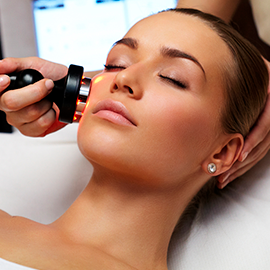 The launch of the skin deep rejuvenation processes provides brilliant result which lasts up to 2 years. The number of treatments, capacity and area of application are determined by a specialist and depend on the patient’s skin condition and the desired result. FRACTORA FIRM procedure can be combined with other treatments: plasmalifting , biorevitalization, mesotherapy, contour plastics.